Note: This example doesn't have anything related to the Qt 4.5 Cocoa Support. Run the Qt4 Server, and the Cocoa Application (Remember to change the SERVER_HOST in AppController.m) and try to send some binary data. The Qt Server will receive this data it will resend you. Protocol is Very easy 1 byte of Data Type (Int8, Int16, ..) and Data. Remember that Intel arch is Little Endian. Note: This is just a "Draft" a "non complete" example only to give the idea on how it works. 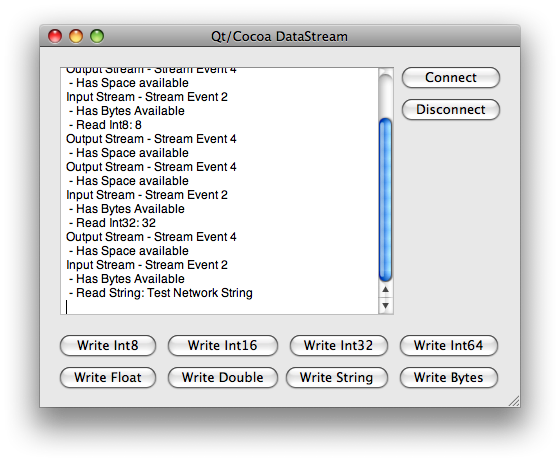 The Source Code is available here: Qt/Cocoa DataStream Source Code.